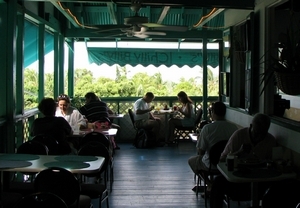 itsislandtime > St. John > Chilly Billy's at the "Lumberyard"
Chilly Billy's at the "The Lumberyard" overlooking beautiful Cruz Bay Harbor on St. John is an open-air place we like to frequent for breakfast when we visit the island. 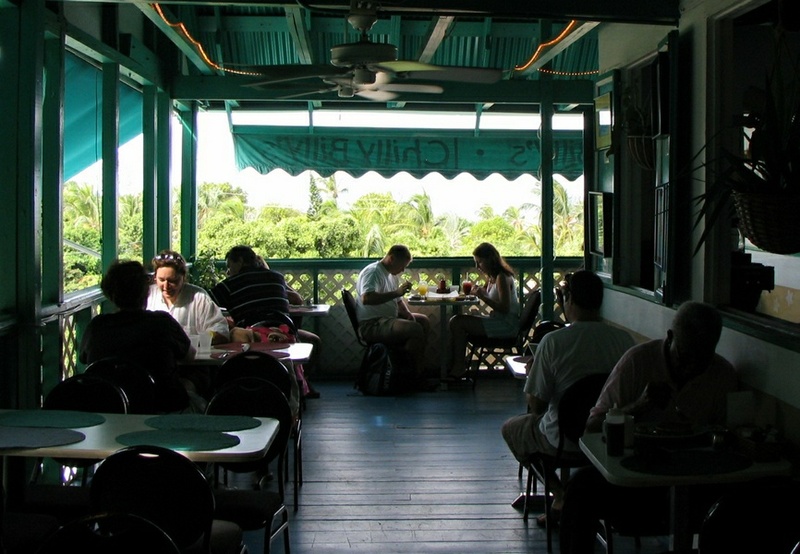 Voted the Best Breakfast on St. John, breakfast is served all day, with early-bird specials available until 10:30 am. Lunch is also served for those who are more traditional about mealtimes. They feature both traditional "bacon and egg" style breakfasts and also special sumptuous type breakfasts. I prefer the traditional type, so on our visits there for breakfast I usually enjoy two sunny-side up eggs, fried potatoes, sausage and wheat bread. Everything is made to order, and even though the place was full at the time of our last visit (guests at all ten tables) our breakfast was served relatively promptly by the efficient waitress, who serves every table in this intimate place. When it's time to leave, perhaps for the beach or shops, the tradition at Chilly Billy's is to receive your very reasonably priced check with a of Dum-Dum Lollipop for each the departing guest. While you?re at the "Lumberyard", be sure to stop in at a neat shop called "Frames of Mind". This place features a unique supply of clever items, in addition to the standard frame shop stock. The goodies in this shop are not those seen over and over in some of the other shops in vacation destinations.